Thanks to everyone that submitted a video, I couldn’t unfortunately fit in every clip that I had but please do continue to submit videos. This episode looks at cyclists cutting up other cyclists, looking but not seeing and watching out for pedestrians. Why is each cyclists silly? 10 – Doing a wheel in close proximity to other road users, potential to cause an accident which would be avoidable. 9 – Cycling on the wrong side of the road, towards other cyclists. 8 – Moving across the path of another cyclist, potential to cause harm to other cyclist. 7 – Cycling no handed through a red light on the wrong side of the road. Not in proper control of the bicycle and unable to avoid any traffic if it came at him unexpectedly. 6 – Cutting up another road user and forcing them to stop. 5 – Swerving into the path of another cyclist, potential for a collision. 4 – Filtering dangerous in a position which could change quickly without warning. Very silly! 3 – Filtering past a bus in a gap which is always going to disappear. Then getting clipped by the end of the bus, potential for a nasty crash. 2 – Cyclist moves around an obstruction in a bus lane without indicating or registering the fact that faster moving vehicles are approaching behind. The following vehicle was required to brake heavily to avoid a collision. 1 – Pedestrian moves across cyclists path on a shared use path. Can be common and traveling at a slower speed should avoid such issues. Thanks once again to all that subscribed to my new channel devoted to silly cyclist and educating other road users on how to avoid certain situations. Thanks also to all that submitted a video for this episode. I had over 20 clips that I had to work down to 10 and it was hard work! I’m sorry I couldn’t use all but please to keep submitting your videos. Credit to filmers for their clips. Why is each cyclist silly? 10 – Jumping red lights is against the law and in this case dangerous. She made the right decision in bailing out halfway. 9 – Cycling the wrong way up a road is against the law, especially in such cases where the two sides of the roads are separated by a barrier. Doing such could cause a collision! 8 – Cycling whilst on the phone is a distraction, a distraction which caused he to fail to give way and forced another cyclist to stop. She also failed to indicate her intentions to other road users. 7 – The cyclist joined the cycle path without looking and failed to give way to a cyclist who was already on the path. Causing that cyclist to slow down to avoid a collision. 6 – The cyclist undertook a moving bus which shortly after was forced to move into the cycle lane due to width restrictions. 5 – A cyclist positions themselves in the blind spot of a large vehicle and could be very life threatening if she isn’t seen. 4 – The cyclist overtakes a car up a hill and is quickly out of his league because of the slope. He also forces a LGV to take avoiding action by moving into the bus lane to avoid a head on collision! 3 – A cyclist takes a risky filtering maneuver and has to avoid a cars wing mirror and turned wheel whilst next to a LGV. 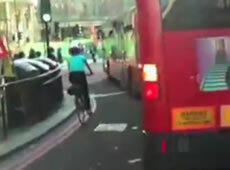 2 – The cyclist tries to overtake a bus whilst it is passing a right turning car, nearly getting squeezed between the two. He later tries to undertake the bus which is indicating left to pull into a bus stop. It’s best we learn where each bus stop is to predict traffic flow and situations where traffic may stop. 1 – The cyclist goes for a gap which is only going to close, and the front wheel of his bike is caught under the rear wheel of the truck. Causing his wheel to be crushed and for him to be thrown to the ground. Taking such a risk move to save only a few seconds is clearly very silly and this presumed messenger is out of action for a few hours and out-of-pocket! I moved Silly Cyclists onto a new youtube channel. The video series has been around for nearly 10 months and has received nearly 100,000 views. I think it’s only right that this gets moved to it’s own channel. Unfortunately that means starting again. So please subscribe if you aren’t currently. Submissions this week come from BadSwindoomRoadUsers, TheScottishJon, DamoDoublemint and samNG41. Thanks once again to those guys and everyone else that has submitted in the past. What did these guys do wrong? Number 10 – Cycling on the pavement. Cyclists are not allowed to cycle on the pavement unless under the age of 16 or if it is shared use. It is possible to get away with it if you show great care for other users and that is only if the road you would have to cycle on is very dangerous. Number 8 – Cycling on the wrong side of the road. Not the best idea and i’m sure it’s against the law. We should be cycling on the right side of the road (the left, bad joke :P) and with the flow of traffic. Drivers will not expect us to be cycling towards them and there is a good chance of a head on collision! Number 7 – Riding down the middle of the road. This cyclist fails to return back to a good road position after they have finished filtering and causes lots of bother with other road users and gets him self in some situations he shouldn’t be in. Cycling down the middle of the road when there is free flowing traffic is not a good idea, add in some traffic islands and you are just causing mayhem on the roads. Lucky for this cyclist, the other drivers seem to be on the ball, mostly. Lets not forget the lack of lights, a big thumbs down! Number 6 – Cycling on the pavement. This cyclists hurls him self down the pavement at some speed to get past the stationary vehicles. If you want to move past the stationary cars it is best done on the right hand side, not only because it’s legal but also because drivers will be more aware of you as motorcyclists will filter there. Cycling on the pavement is against the law, doing it that speed is just idiotic! Number 4 – Not looking. This cyclist joins the road without looking where they are going. Looking is very important as it lets you know if anything will HIT YOU! Lucky for this cyclist, samng41 was looking where they where going and managed to stop/slow down in time! Number 3 – Reading the road. It was clear from early on that this bin lorry would be doing something like this. And going up past it was a stupid idea and luckily for the cyclist someone shouted out and the lorry stopped in time. It could have ended up with another fatality for london’s streets this year and that is something none of us want. Just stop and wait for a few seconds and have a breather / drink. Number 2 – Reading the road. This cyclist was just not reading the road or the situation well enough. I could see ahead that several vehicles had stopped for what seemed to be no reason, this should straight away cue the thought of right hook and i immediately slowed down and shouted a warning to the other cyclist. He only just scrubbed a small amount of speed and was lucky the other driver was aware of the issue, i seriously thought he might get hit.Lets not forget that setting up your brakes is very important, this cyclist probably couldn’t stop due to the fact that their front brake will barely stop them. Number 1 – Bendy Buses. Bendy buses are so unpredictable that they are predictable! This cyclist takes his life into his own hands as he tries to filter past a bendy bus that is in the middle of making a turn. Somehow the driver of the bus saw him and managed to avoid a collision. This is a MAJOR risk for a cyclist to take and there is a huge potential for getting knocked off. These are the sorts of vehicles that kill cyclists, stay away from the inside of them as they are dangerous! Good Cyclist – Little needs to be said about this cyclist, his position is great and not seen often enough. A big thumbs up and a round of applause for showing everyone how it should be done! This was the first episode where all clips where from other cyclists. I’m very pleased that it came so soon and I can’t thank the other road users that are sending me videos. It is helping this series get more views due to loads of good content and i’m hoping it’s getting you a few more subscribers. There are some very dodgy clips in this episode, including a head on collision, some very close passing by other cyclists, cyclists on the wrong side of the road, some oil and a few cyclists not looking. This episode of silly cyclists see’s us looking at issues with red light jumping, using a mobile, road position, filtering past coaches, filtering past HGV’s and swerving on the road + general bad road behaviour. A good episode and one not to be missed!! Episode 24 of silly cyclists looks at brakes, filtering, red light jumping and general bad cycling. I got lots of submissions this week but unfortunately couldn’t use them all. This video features CyclingMikey, SkrzypczykBass and tommikomulainen. It’s good to remember than your front brake can stop you almost twice as quickly as your rear brake! This episode if silly cyclists look at brakes, blocking pedestrians, skidding, headphones, cycling the wrong way, indicating, filtering, red light jumping, HGV’s, joining the road, cutting up and falling over! This episode of silly cyclists looks at cycling on the pavement, red light jumping, filtering, light positioning, ranting and getting crushed by a HGV. Episode 21 looks at cycling on the pavement, lights, controlling your bicycle, red light jumping, road positioning, where to stop and bicycle maintenance.